"Regus gives you the opportunity to grow your professional network, whilst reducing your costs and increasing your productivity. The Business World membership provides access to all of our co-working spaces worldwide. It also allows you to work flexibly during office hours. Full access to admin support, mail-handling, access to office equipment such as printer, scanner and copier, and provided business grade Internet and WiFi. Authorised use of Business Lounge and Meeting rooms. Use of kitchen, utilities and cleaning facilities. Our business centre – the Trade Tower Nepal – is situated in the heart of Kathmandu and therefore easily accessible from all parts of the city. 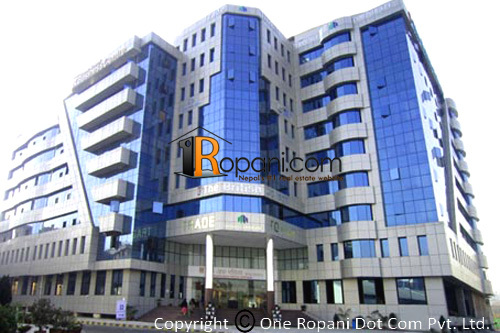 Our business centre is an elegant commercial complex, with offices starting from 5m2 to 1000m2 or more. All sizes, all budgets covered. Regus is the world's largest provider of flexible workspace, able to meet the needs of large corporates and small businesses alike. We are currently serving more than 1 million clients every day; providing convenient, high-quality, fully-serviced spaces for people to work, whether it's for just a few minutes, or even a few years. A total space of 50m2 includes shared space in the Business Lounge with high-quality office furniture and common facilities such as kitchen and reception areas. All prices are subject to availability. Coworking at Kathmandu, Trade Tower Building -Never work alone anymore!